Gute Lage für Ausflüge in Natur und Besichtigungen. Sehr nette Gastgeberin, die nützliche Tips gegeben hat. Gute und moderne Ausstattung. Wir hatten sogar eine gute Bratpfanne (selten in Fewos), in der wir unsere gefundenen Steinpilze braten konnten. Wanderkarten der Umgebung waren zum Ausleihen da. 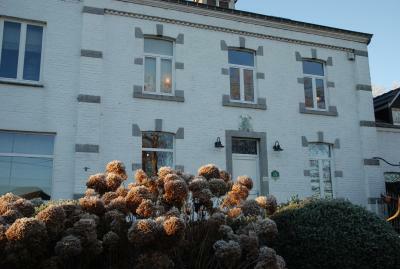 De accommodatie was netjes en schoon, de locatie was mooi en rustig. Hele vriendelijke mensen, lief gezin. Schoon. Veel informatie over de omgeving. Privé badkamer. Located in Fronville, Bed & Breakfast Ô lit de l'Ourthe is located 5.6 mi from Durbuy and close to Hotton (2.5 mi) and Marche-en-Famenne (7.5 mi). Free WiFi is offered throughout the property. The spacious and light rooms overlook the village and garden with flowers and playground. Rooms include a flat-screen TV and private bathroom. Free private parking is available on site and motorbikes and bicycles can be stalled in the garage. Hiking and cycling trails start right outside B&B Ô lit de l'Ourthe. When would you like to stay at Bed&Bike Ô lit de l'Ourthe? House Rules Bed&Bike Ô lit de l'Ourthe takes special requests – add in the next step! Please note that the rooms are located at the owner's boutique. The accommodations is not suitable for children under 8 years old. Contact the property for an alternative and more information. Please note that late check in is available upon request. Please contact the property for more information.